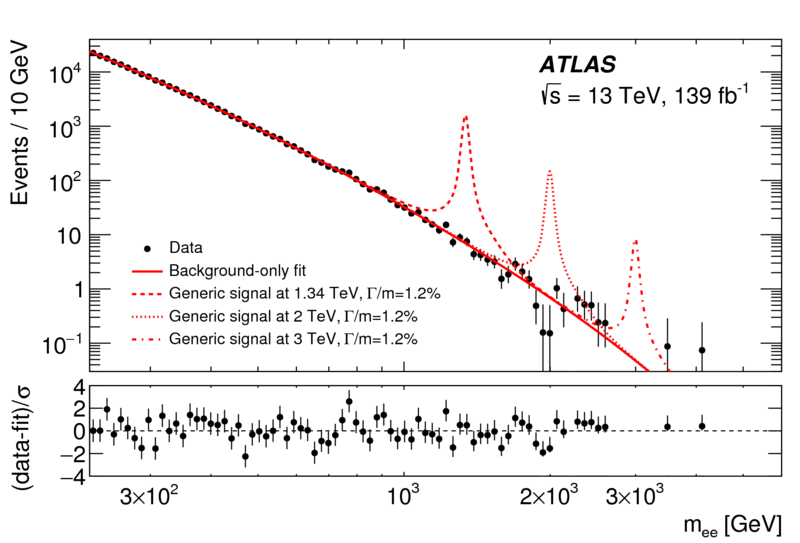 In March 2019 the ATLAS collaboration has submitted its first publication utilising its entire LHC Run 2 dataset, collected between 2015 and 2018. This analysis searches for new heavy particles decaying into dilepton final states, where the leptons are either two electrons or two muons. Searches in the dilepton (dielectron and dimuon) final state have a long and illustrious history with the discovery of the J/psi meson in 1974 and Upsilon meson in 1977 as well as the Z boson in 1983 (with major involvement of physicists from LAPP). As these were key steps which led to the establishment of the Standard Model of particle physics, the study of the same final state could help to pave the way to a more complete understanding of the physics processes beyond it. This is one of the most sensitive decays to search for new physics, thanks to the ATLAS detector’s excellent energy and momentum resolution for leptons and the strong signal-to-background differentiation as a result of the simple two-lepton signature. Unfortunately no sign of new physics has been observed thus far. This study has deepened the exploration of physics at the energy frontier. ATLAS team at LAPP played a major role in this work. The LAPP ATLAS team benefited from the financial support of Labex ENIGMASS for this research program.